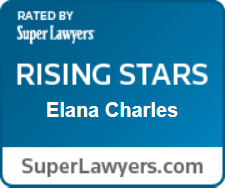 Elana enjoys a broad litigation practice which builds upon her experience representing marine industry businesses, insurance companies, and other corporate clients in a wide variety of civil disputes. She specializes in maritime and admiralty law matters, including Longshore and Jones Act personal injury cases. Elana is a recent Portland transplant from the Midwest, where she received her J.D. from Washington University in St. Louis. She has been admitted to practice since 2012. Before moving to Oregon, she was admitted to the Bar in Missouri, Colorado and Illinois, and brings with her diverse civil litigation experience in numerous state and federal jurisdictions. Before joining Lindsay Hart, Elana worked as an associate attorney at Goldstein and Price, L.C., where her practice focused on maritime and admiralty law, and also involved providing full-service representation to businesses engaged in commercial activities on and about the U.S. inland waterways. Her diverse practice also included a wide variety of civil litigation, commercial disputes and transactional matters, including insurance coverage and defense, torts and toxic torts, breach of contract, professional liability, and regulatory compliance and administrative law proceedings.